Priority Species under the UK Post-2010 Biodiversity Framework. Atlantic salmon are listed on schedule 3 of the Conservation (Natural Habitats, &c.) Regulations 1994. For Schedule 3 species, it’s an offence to use certain methods to catch or take fish in freshwater. Atlantic Salmon are a large fish native to Scottish waters. They like to live in clean, flowing rivers with gravel as the main riverbed material. Atlantic Salmon are anadromous fish, this means that during their life-cycle they live in both freshwater and marine environments. They hatch from eggs laid along the whole reach of a river and spend their early life in freshwater. After several years they migrate to sea where they live their adult life. Salmon that ‘run’ to the sea are known as ‘smolts’. Whilst at sea their diet consists of many marine organisms such as sand eels, herring and plankton. After travelling thousands of miles around the north Atlantic, the now large adult fish return to their origins to spawn. Once they enter the estuary and encounter freshwater they stop feeding. They start the journey upstream leaping obstacles to return to where they hatched to spawn the next generation of fish. After spawning they are known as ‘kelts’ and most will die from exhaustion, although a few will make it back to sea to complete the cycle again. The Atlantic salmon is a species of ray-finned fish in the family Salmonidae, (the same family as Brown trout). Adult Atlantic Salmon are much larger than brown trout. Salmon are silvery with a few dark spots on the back and may have a pinkish flush to the belly. Mature males may develop a hooked lower jaw, or ‘kype’, in the breeding season. The Forth Rivers Trust runs redds identification workshops annually and are always looking for volunteers to get involved with redd counts. If you’re interested, get in touch. 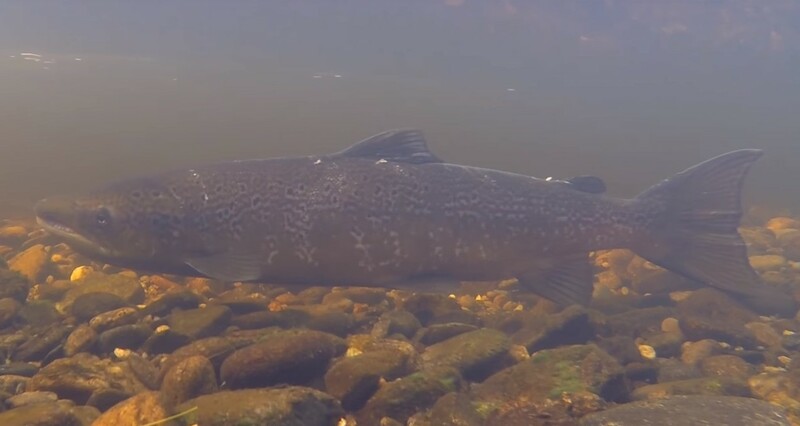 Have you spotted an Atlantic Salmon in your local river? We want to hear from you! If you have, then send your photos or stories to us at riverlife@forthriverstrust.org.